I’m a little bit – low key but also not-so lowkey – obsessed with the retro vibe, whether it’s on the big screen, the small screen, fashion, music, the whole shebang. The atmosphere that’s portrayed in Stranger Things reminds me a lot of Twin Peaks, and old Stephen King movies. I could watch anything that skillfully recreates that period. My love for the 80s started when I was a wee one. Both my parents grew up in the decade, and also started dated then, and I grew up listening to the music, and when I started researching the culture, I was instantly hooked. How can I go about with the list without mentioning the amazing starlet that is Winona Ryder? In my mind, she is cast perfectly for this part. I remember her from movies such as Beetlejuice, Edward Scissorhands, and Girl, Interrupted. She was always cast as the girl that didn’t quite fit in with others. 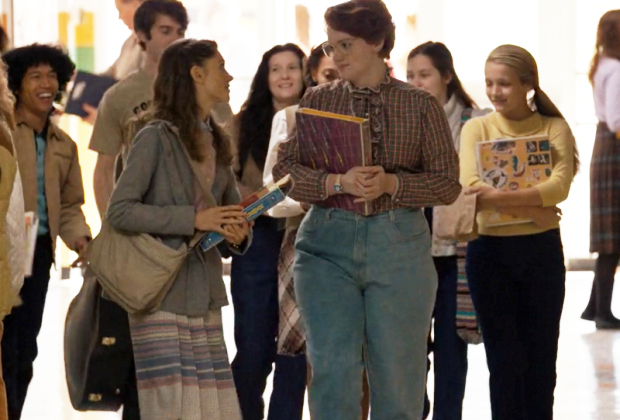 In Stranger Things, she is still the first person that is willing to accept possibilities that are beyond the acceptable. It’s not just the adults that did the job, however. The teenagers themselves deserve a LOT of kudos for their portrayals. This should be obvious in a show that is so heavily cast with children, but believable child actors are not easy to come by. Unforgettable acts of friendship show us what real loyalty and trust look like. In the age where people’s words mean less and less, it is great to see a story that circles around keeping one’s word. Evident is the friendship between Mike and Will, where Mike did everything he could to find his missing friend, all four of the boys amongst each other, Nancy and Bard, and the introduction of the mysterious Eleven into the boys’ friendship circle. The science in this show is UN-REAL. Mr. Clarke’s explanation of the multidimensional universe to his students deserves a medal and several awards, if you may. This is what teachers are for. He went out of his way to explain this in a simple form with which both the viewers and the characters themselves – who are preteens – could understand. So kudos to you, Mr Clark! Although all characters on this show seem rounded and well developed, personally, I think that Dustin deserves an honorable mention. He’s funny, observant, and awfully intelligent. He is also the glue that holds the group together. And that face, how can you not want to pinch his cheek and put him in your pocket?!?! I got two names for you: Jonathan Buyers and Steve Harrington. And if you’re into the older ones, Hopper’s the one for you. Do you watch the show? Or are you one who hasn’t yet but will after reading this post? Let me know below! Let’s start a discussion! Did not realize you did a Review! Just posted mine last night. I’m addicted to this show for sure. Me too! I watched it in one sitting, I just couldn’t resist! !